of mice out there, and most are ill-suited for gaming. To help you cut through the crap, we spent 80+ hours testing 41 different gaming mice. Here are our top picks for 2017, along with all the information you need to know when shopping for a new mouse. It’s not the most customizable mouse out there and it might not have the most buttons, but Razer’s DeathAdder Elite is one of the most revered gaming mice for a reason. Used by professional gamers on various teams and across numerous games, this mouse has everything you need to take your gaming to the next level. Razer basically identified the most important characteristic of any solid gaming mouse – form factor, precision, durability, and on-the-fly settings – and made sure they released a mouse that demonstrated the very best of all four. Branded as “the world’s most advanced optical sensor,” the DeathAdder Elite boasts a 16,000 max DPI setting along with 99.4% resolution accuracy. That DPI isn’t static, of course, and you have quick-switch DPI buttons ready and waiting. Physically, the mouse utilizes Razer’s proprietary mechanical mouse switches (rated to last for 50 million clicks), a fantastically tactile scroll wheel, and all-around perfect weighting and form. We’re a fan of Redragon gear here at Armchair Empire, and the M901 PERDITION is no exception. Besides the awesome name, this bad boy clocks in with a maximum 16400 DPI, 5 different DPI settings (1000 / 2000 / 4000 / 8200 / 16400), an Avago sensor and Omron micro switches – it’s a total beast under the hood. You then have buttons for on-the-fly DPI switching along with 18 programmable buttons to choose from, 5 button profiles that you can save specific configurations to, and 16 million color options to pick from for the LED lighting. Performance-wise, we couldn’t be happier with this slick little mouse. There’s no packaging fanfare and the mouse may look slightly cheaper than a comparable Razer model at first glance, but those thoughts will vanish as soon as you get your hands on it. The entire thing is perfectly-weighted right out of the box (although it does come with additional tuning weights! ), well-made, and incredibly ergonomic. Maybe it’s just a coincidence, but I honestly felt like the mouse was custom-made for my hand. I will say that people with smaller hands should be a bit wary, though – it’s not the smallest mouse in the world. Overall, it’s rare to see such a great intersection of functionality and form factor at this affordable price point. Looking for a professional-grade wireless gaming mouse? The Logitech G602 does it better than any other wireless model we’ve tried out. The number one issue that most gamers have with wireless mice is probably battery life. No matter how much forethought you have, you will end up forgetting to charge your mouse and losing power in the middle of an important battle. Logitech clearly knows this, because they ship the G602 with an advertised 250 hours of battery life. That’s literally 300-400 League games, to put it in perspective. Logitech backs that stellar battery life up with all the other trappings of a true gaming mouse. It has 11 programmable buttons, on-the-fly DPI adjustment (ranging from 250 – 2500 DPI), and its hardware is rated up to 20 million clicks. Connectivity wasn’t an issue for us – it’s always best to keep the mouse as close to its receiver as possible, but performance was on par with any other top-tier wireless mouse out there. From its catchy name to its sleek, dark design, Logitech’s Proteus Spectrum screams “gaming mouse” from the get-go. The G502 isn’t the cheapest option you’ll find, but the thought and care that Logitech so clearly put into this mouse more than justify the cost. I can’t quite put my finger on it, but there’s something I really liked about this mouse while testing it out. It does offer buttons galore, but Logitech did a fantastic job placing them appropriately. I found myself taking advantage of every last button within 30 minutes of using the G502, due to the intuitive layout. Another thing I really enjoyed is the scroll wheel – you can hit a button that causes the scroll wheel to spin freely, allowing you to flick it with ease for uber fast scrolling (or just to play around with). All the usual bells and whistles are in place as well: 5 DPI settings ranging from 200 – 12,000 along with on-the-fly switching capabilities, 11 programmable buttons, 16.8 million RGB color options, and adjustable weight + balance, to name a few. As a quick note, this mouse fit very comfortably in my rather large hands – if you have smaller hands, I’d definitely see if you can test it out in person before buying. A gaming peripherals list isn’t complete without a Corsair product on it, so we’re happy to recommend the M65 Pro from Corsair. Built with Aircraft-grade aluminum, this mouse may be the most durable on our top 5 list – we wouldn’t expect anything less from Corsair, as they definitely put a lot of emphasis on build quality throughout their products. The mouse does feature 8 additional buttons throughout, but Corsair also managed to keep the mouse looking stylish and smooth. The design is rather unique among gaming mice and really conveys a sense of top-notch quality. We do want to highlight the “surface calibration tuning utility” feature – this is one of those cool little additions that leaves you thinking “why don’t all manufacturers do that?” Between said utility and the best-in-class Pixart 3360 optical sensor, the M65 tracks like a dream. You won’t run into any jitters, floatiness, or inaccurate movement with this beauty. 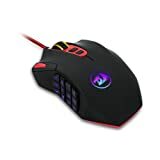 Lastly, the M65 checks all other necessary “gaming mouse” boxes: it features a max DPI of 12,000, allows on-the-fly DPI switching via a “sniper button” by your thumb, it’s built with high-capacity Omron switches (rated for 20 million clicks), and it comes with configurable weights and fully customizable RGB lighting. Through and through, another stellar product by Corsair. Your mouse is perhaps the single most important aspect of your PC setup. Think about it: Sure, a nice monitor enhances your gaming experience and a high quality mechanical keyboard is good to have, but you can make do just fine with generic models of either peripheral. When it comes to mice, there is nothing more frustrating than whiffing a headshot due to poor tracking, dying because of a misclick, or screwing something up because the mouse isn’t quite precise enough. Movement is at the core of most games, whether you’re moving a character around or controlling the camera. 99% of the time, that movement is generated and controlled by your mouse. To be blunt, gaming with a crappy mouse subverts fundamental aspects of game design and leaves you at an inherent disadvantage in both single player and multiplayer games. Honestly, that should be all the convincing you need to go out and get yourself any halfway decent gaming mouse. If you need more convincing…well, gaming mice look and feel awesome, too. Your friends will be jealous, you’ll play better, and you don’t need to break the bank. Sounds like a pretty good deal to me! Once you dip your toes into the world of gaming mice, you’ll quickly realize just how muchinformation is out there. The deeper you dig, the more confusing it can get. It doesn’t help that the fanboys are out in full force regarding gaming mice either – some people hold obscenely strong opinions when it comes to selecting the perfect gaming mouse for your needs. We like cutting through the BS here at Armchair Empire, so let’s take a closer look at what you should actually keep in mind while mouse shopping. This is one of the most common mouse debates out there: optical or laser? First, a quick overview of how mice work: Modern mice determine movement speed and direction by using optical sensors (CMOS sensors) to take thousands of pictures per second, and then comparing these images to each other as you move the mouse across a surface. Semantically speaking, all mice are “optical” – they all determine movement using optical sensors. When people refer to “laser” and “optical” mice, they’re really talking about the illumination mechanism that allows the optical sensor to “see” whatever surface you’re using the mouse on. “Optical” mice utilize red LEDs to illuminate the surface while “laser” mice utilize…lasers (specifically VCSELs). So, what’s the difference? Basically, LED illumination (“optical” mice) is more topical or “surface” illumination – the images taken by an “optical” mouse only take the top layer of a surface into account when determining movement speed and direction. Laser illumination, on the other hand, is much more accurate than LED illumination. It digs down into the structure of whatever surface your mouse is on, instead of just the top-most layer. The difference between these two illumination methods becomes increasingly apparent the slower you move your mouse. At super slow tracking speeds the laser illumination will pick up every peak, dip, crevice, bend, and fiber in the surface you’re using, which can result in greater image variation and ultimately inaccurate mouse movement. To put it simply, laser mice display greater variation in tracking efficacy at fast vs. slow speeds, while optical mice produce more uniform movement at all speeds. That all being said, few gamers will notice a big different between optical and laser mice. If you opt for a laser mouse, any tracking inconsistencies can be resolved by using the mouse on flat, hard, uniform surfaces. DPI is the most referenced spec of gaming mice, but it’s also become somewhat of a marketing buzzword in recent years. If you don’t feel like reading the more technical stuff below, all you need to know is that DPI settings are highly subjective and depend on both screen resolution and game type. You’re best off testing out a high-DPI mouse in person to really understand how it works. DPI stands for “dots per inch,” and it’s easiest to think of it as how fast your mouse can move (although it is different than your mouse software sensitivity setting – DPI is a function of your mouse’s hardware). The higher the DPI, the faster/further your cursor moves proportional to the physical movement of your mouse. A high DPI means small mouse movements cause your cursor to go further on your screen than it would at a lower DPI. Please note that this a simplification of what DPI is and how it works, but it gets rather technical and we’re going to keep it high level for this guide. While shopping for a gaming mouse, you’ll see some truly ridiculous DPI claims – mice featuring DPI of 10,000+. Unless you’re a professional-grade FPS player, you can discount most of the DPI information you see. If you’re still caught up on it, go ahead and buy a mouse that has multiple DPI settings. You’ll be able to play around and figure out what DPI settings works best for you and the type of gaming that you do. DPI does become more important for FPS players, because variable DPI lets you do things like increase your DPI in proportion to your mouse sensitivity to achieve super smooth, accurate movement while scoped in and sniping, for example. Polling rate refers to how frequently your mouse “talks” to your computer and reports its current position. Standard wired mice have 1000 Hz polling rates (1000 Hz = your mouse reports its position once every millisecond) while standard wireless mice have 500 Hz polling rates (500 Hz = your mouse reports its position once every 2 milliseconds). For most gamers out there, you shouldn’t waste time worrying about polling rate. The difference between 1ms and 2ms isn’t noticeable to the non-professional eye, and all modern gaming mice feature one or the other. In times past, it was fairly undisputed that wireless mice were not for serious gamers. Objectively, that remains true: Most modern wireless mice feature lower polling rates than their wired counterparts, are beholden to rechargeable batteries that can die mid-game, and require a clear line of sight to their USB receivers (lest your wireless signal gets interrupted and your mouse starts behaving oddly). The reality of the situation is that wired vs wireless is more of a personal preference than it ever has been. If you’re set on getting a wireless mouse you’ll game long and happy without noticing any sort of performance degradation. On the other hand, if you don’t need a wireless mouse you may as well go straight for a wired unit. Battery issues and signal interruptions are easily avoidable but can still be quite annoying if you forget to plan for either situation ahead of time. If you’re a big-time FPS player, you might want to invest in a mouse with multiple DPI settings. Variable DPI can be insanely useful at top level FPS play, whether you want to line up a sniper shot, practice your flick shots, or do a 180 as efficiently as possible. FPS-specific mice often come with a dedicated DPI button that you can hit to instantly increase or decrease your DPI. These mice may also come with removable weights, so you can really customize the heft of your mouse. What’s the one thing you need when playing an MMO? Buttons. Lots and lots of buttons. Well, peripheral manufacturers heard your call – there are tons of mice out there with extra programmable macro buttons built in. You can opt for just one or two extra buttons, or you can go all out and buy a mouse that has 10+ extra buttons on the side. It all depends on what you need in game! Generally speaking, RTS mice should be streamlined and straight forward. Your APM is crazy as-is, and you don’t want to get distracted by DPI buttons, strange weighting, or 15 extra macro buttons. That being said, and extra button or two can be quite useful in RTS games – they make for easy unit grouping and allow more flexible macro play no matter what else you may be doing. Customizable mice are just that – customizable. These bad boys tend to be more expensive, but you can tweak and adjust until you’re 100% happy with the result. Different models will come with different modular customizations – you’ll be able to swap out your palm rest, scroll wheel, buttons, weight, and more if you opt to splurge for a fully customizable gaming mouse.